In these tales from the start of the 1950s, the Penguin commits a series of crimes inspired by state birds and Catwoman becomes empress of the underworld! Plus, the debut appearances of Deadshot and Killer Moth, and the origin of the Red Hood. 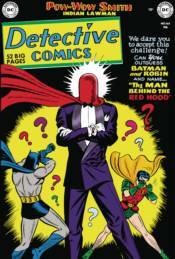 Collects Detective Comics #154-173, Batman #56-66 and stories from World's Finest Comics #43-52.